Gough, one of Gwyn's Four Knights. anchored to the ground when fired. Only uses specialized great arrows. Found in Anor Londo above the area where you fight Ornstein and Smough. There will be a broken stained glass window that leads to some small steps followed by a very tight ledge. Hug the wall while on the ledge, all the way around the building then roll off the end, over some railings. After landing on the spot with the Dragonslayer Greatbow, get out through a large hole in the fence, towards the section with the Giant Blacksmith. Can only be used with Dragonslayer Arrows and Gough's Great Arrows. Outclassed by Gough's Greatbow in both range and damage due to better stat bonuses. Damage is further modified by the types of arrows or bolts used. Range: The Range determines the maximum distance an arrow or bolt can be fired. Damage will decrease proportionately with the Range stat the further the arrow/bolt travels. Weight: The weight of the weapon. Note that carrying over 50% of user's Equip Weight will reduce the speed of their rolls, while going over 100% will reduce their regular speed to walking and attempts to roll or backstep will leave them momentarily stunned. 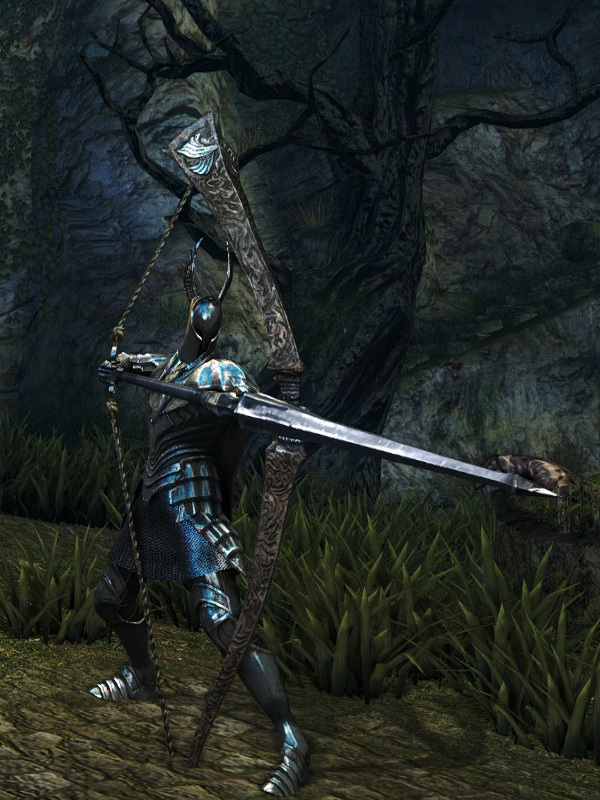 Also keep in mind that the player character gains a 50% bonus to Strength by wielding a weapon with both hands, thus reducing the actual Strength required. For example, a character with 18 Strength can wield a Great Axe (Requires 26 Strength) properly if she holds the weapon with both hands (18 x 1.5 = 27). Stat Bonuses: The Stat Bonuses rating indicates the level of bonus players receive based on the associated Stat when they use a weapon. This rating can be S, A, B, C, D, or E (in order from most to least bonus for the associated skill). 1. Even though it is 2-handed, the requirement is not lowered. 20 Strength is always required.